Pretty sure you should bake this cake for Easter because it just so happens to be one of the BEST I’ve ever made. I’m not saying that because I really want you to make it; I’m telling you because this wonderful version is incredibly moist, full of nutritious, healthier ingredients and is gluten free. Cue jumping on couches Tom Cruise style. Could you call this a healthy carrot cake? I’m going to say YES. But how, you ask?! Well, typically carrot cakes are laden with butter and/or oil and unnecessary amounts of sugar. 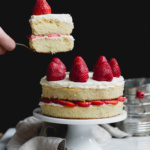 I’m not saying that the occasional indulgence is terrible for you, however you might find yourself wanting to bake a better for you treat and your loved ones. My version is made with nutritious flours (almond & oat) and the cake is naturally sweetened with maple syrup. All that butter and oil isn’t necessary in this beauty! Seriously, I’m obsessed with this cake. We brought it over to a party and everyone devoured it. I mean actually devoured without napkins or forks. Only hands, face and cake. That should pretty much convince you that it’s worth a try. 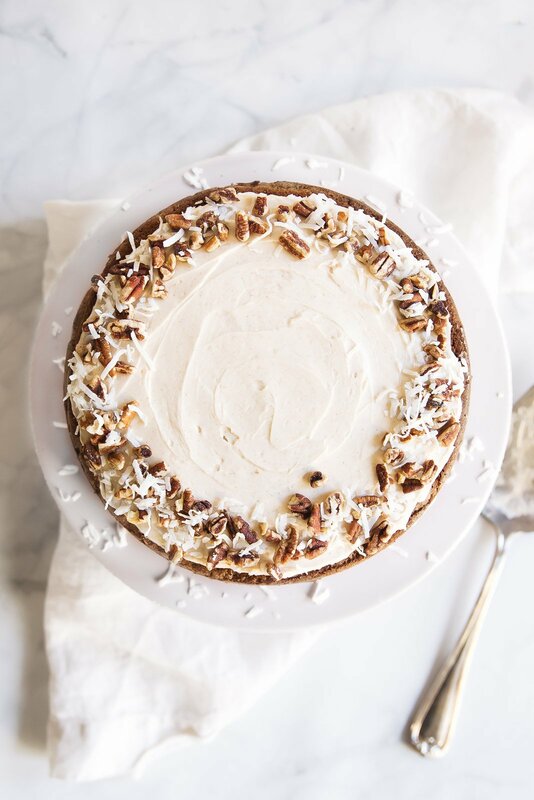 When it comes to carrot cake, we must discuss your preferences: Are you the type of person who loves tidbits of pineapple? What about nuts? Raisins? Coconut?! Something else? I feel like it’s an ongoing debate between us carrot cake lovers. I say yes to all the things, but know that if you want to leave out the add-ins, this cake will still have unbelievable flavor and texture. This is a recipe I promise you’ll come back to, year after year. I’ve also included how to bake them into cupcakes/muffins in the notes section below so you can feel free to bake it as you so choose. Please let me know if you give this recipe a try by commenting below or tagging #ambitiouskitchen on Instagram, I always love hearing from you. xo! 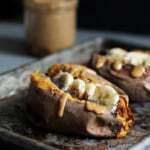 This recipes comes to you in partnership with Peapod. 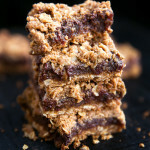 You can find a few of my recipes over on their recipe site FromthePod.com. This week we ordered our groceries from Peapod because I knew it was going to be a hectic week for Tony and I. If Peapod offer services near you, I highly recommend trying it out! 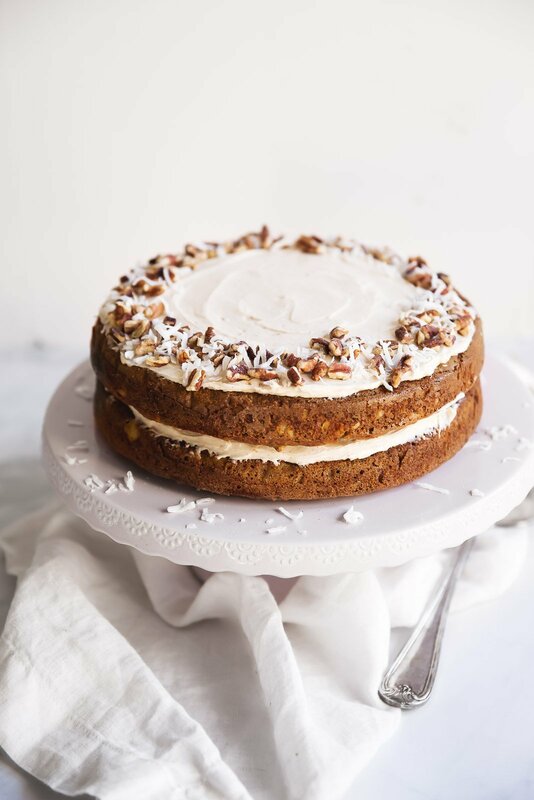 A lightened up gluten free carrot cake made from a mixture of almond and oat flour. Topped with a lovely, thick cinnamon cream cheese frosting! Perfect for parties, Easter, or any holiday! Preheat oven to 350 degrees F. Line two 9-inch cake pans with parchment paper and generously spray with nonstick cooking spray. The parchment paper makes it easy to remove the cakes from the pan. Tip: I recommend turning the pans upside down and placing parchment paper on top. Use a pencil to trace the cake pan, then cut out the outline with a scissors and place parchment in each pan. Spray with nonstick cooking spray. In a large bowl, whisk together oat flour, almond meal, baking soda, cinnamon, nutmeg and salt. Set aside. In the bowl of an electric mixer (or you can mix by hand), add in carrots, eggs, maple syrup, almond milk, vanilla extract, coconut oil and apple cider vinegar. Beat on medium low speed until ingredients are well combined and smooth. Add in half of the dry ingredients and mix on low speed until combined. Add in the other half of the dry ingredients and mix on low speed again until just combined. If desired, fold in any of the following with a wooden spoon: raisins, coconut, nuts or chopped pineapple. Divide batter evenly among the two prepared cake pans and smooth top with a rubber spatula. Bake for 23-27 minutes or until toothpick inserted in the middle comes out clean with just a few crumbs attached. Cool cake in the pans for 30 minutes, then invert cakes on a wire rack, removing from the pans and allowing to cool completely. At this point you can remove and discard the parchment paper. Once cakes have cooled completely (about 2 hours), you can prepare the frosting. In a medium bowl, beat cream cheese until smooth and creamy. Slowly add in powdered sugar, vanilla and cinnamon and mix on low speed until well combined. Divide frosting in half and spread over each cake. 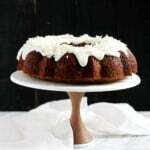 Once frosted, place one cake on top of the other and sprinkle with extra pecans and coconut, if desired. Serves 12 (12 large slices). Cake should be kept covered in the fridge for optimal freshness and will stay good for 4-5 days. Nutrition information does not include pecans, coconut, pineapple or raisins. If you want to make vegan frosting you could try using a vegan cream cheese in place of the regular cream cheese. I have not tested this cake with homemade oat flour, only the store-bought version. If you decided to make it with homemade oat flour, please make sure that it is very finely ground. 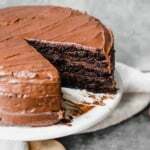 This cake also works well when baked in a 9x13 inch pan. You may need to bake slightly longer, but I would still check it at the suggested time. It’s a great party cake! You can also make these into carrot cake cupcakes (or muffins without the frosting). They will make about 16 cupcakes as you should only fill the cupcake pan 3/4 of the way full. The frosting isn’t excessive at all, but if you want to make this for a special occasion or a birthday, feel free to double the frosting! This post is in partnership with my friends at Peapod. All recipes, opinion and text are my own. Thanks for continuing to support AK and the brands that help make this site possible! 79 Responses to "Lightened Up Gluten Free Carrot Cake with Cinnamon Cream Cheese Frosting"
This cake looks amazing Monique! Perfect for Easter! This looks amazing!! We have a nut allergy in the family. What can I use instead of almond meal? Just increase the oat flour? I love sneaking veggies into dessert…great way to make kids & mom happy ? Sorry Jen, I’m not sure the cake would quite be the same without the almond meal. Hmmm, carrot cake and healthy? I don’t see why not! You can healthify ANYTHING nowadays, especially carrot cake because of the vegetables it contains! Plus, it’s my favorite type of cake for the spring! This recipe is making me so happy. I cannot wait to make this for my fam on Easter!! I’ve been looking for a good gluten free carrot cake. This looks perfect! Beautiful! This is definitely on my “to do” list! My neighborhood is full of gluten free needs so I’m totally going to rock this cake at our Easter shindig! Drooling!! I NEED to make this! I can’t even with this cakes…carrot cake is my favorite!! Thanks for the flax seed tip to make it vegan. I’ll definitely be trying that! I love that you used oat flour in here. Thanks, Monique! Carrot cake is my fav! I love that this version has nuts, raisins, coconut, pineapple and perfectly thick cream cheese frosting! WINNER! Okay so I’m kind of freaking out about this recipe. I had all the ingredients (except for maple syrup) and have been craving carrot cake. So naturally, I had to make this. Oh. My. Gosh. This cake was absolutely amazing. I made it for my boyfriend and normally he can tell when the things I bake are healthy. But not this time. 5/5 / two thumbs up / printing this recipe right now to save forever. P. S. Since I didn’t have any maple syrup, I used honey instead and it still was delicious. Woah! Bright and beautiful photography! I love it! Can’t wait to try this cake! Naked cakes are my favorite and I love that this is a carrot cake! Looks so beautiful! Love this cake!!! Not only is it gorgeous but it sounds delicious!!! Great job Monique ? Would the baking time be the same if making these into cupcakes? Thanks! This is gorgeous, and the crumb looks perfect! I made this yesterday & it’s AMAZING!! Truly, I wish I hadn’t even put the icing on it! It’s wonderful without it, and that’s the only part that’s not healthy…I’ll definitely be making this again! Love it! This looks fabulous and the only item I’m missing is oat flour. Could I make it with wholewheat flour? Or a multi purpose? I don’t have a problem with Gluten. I haven’t tried it with any other flours other than what is listed in the ingredients above. You could maybe try whole wheat, but I’m really not positive it would turn out. Monique, I love this for spring and EASTER entertaining. I want to make this! 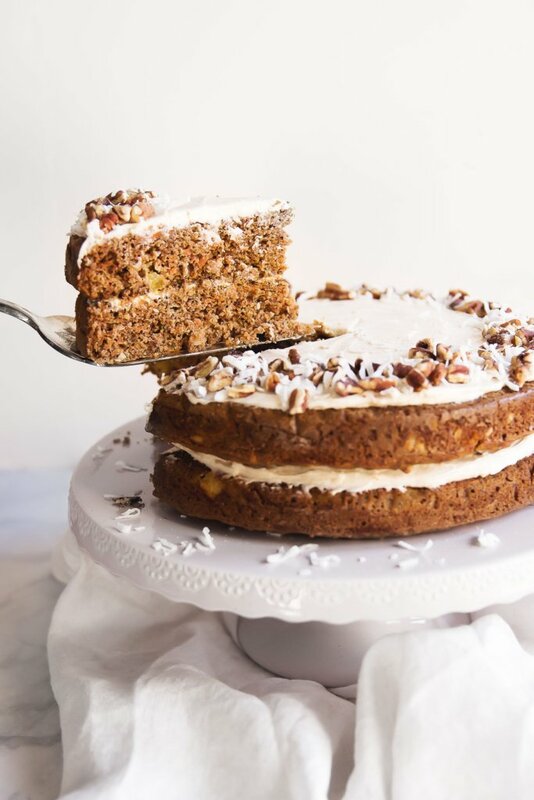 I’m all about the add-ins too and as a carrot cake aficionado (ok, i totally just gave myself that title but it IS my favorite cake out there), this one looks AMAZING! 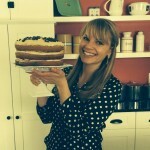 This cake looks utterly delicious and I love it that is GF! 🙂 Lovely photos as well. I was disappointed with the results. I tried to make cupcakes and the promised information in the notes was seriously lacking. I adjusted the time but not enough and the first batched, 350 for 19 minutes were over done. I didn’t use any optional items as I was excited about the recipe so wanted to taste it clean before adding anything. Rereading the posts I realized only 1 or 2 people actually made the recipe – oops I won’t make that mistake again. I like the mixture of oat flour and almond meal but the search continues. This sounds more like user error and that you simply over baked the cupcakes. May I ask how many you baked them into and what changes you made to the recipe? I just had someone else write on my FB page today that they made the recipe into cupcakes and they were wonderful. I didn’t make any changes, I followed the basic recipe without adding any additional items. I agree the first batch was over baked but there was no time or temperature adjustment listed in the notes. I don’t think it was user error, I love baking and have had a lot of luck with gluten free recipes but not everyone has luck with every recipe. This looks amazing? If I take. I ute oats and grind them into flour texture is that considered oat flour? Thanks!! Hi. Thanks for the recipe. I made it yesterday and it is so amazing. I didnt have oat flour so I used sorgum flour instead and worked really well. I also made a healthier topping with cashew nut cream (blend soked cashew nuts with pure water, vanilla and coconut sirup). Perfect! Hi Monique! 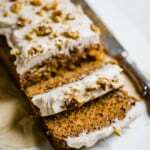 In the original gluten free carrot cake recipe did you add in ALL of the add ins? But I made this for my moms birthday today and boy oh boy was it a success! Super easy, heathy, and tastes just like the real thing! This is gonna be a staple. Oh and I topped it with shredded coconut and a few walnuts around the circumference and it was amazing! Thanks Monique! Love, love,love these! I did them as muffins. I milled my own oats and almonds, made them as muffins. I did not use any icing, they are amazing! Gave them to a few of my clients after my bootcamp class and they immediately wanted the recipe! Keep up the great work here, you are the bomb! Very yummy and moist! Even my non-gluten-free friends loved it. By the way, the cloves were left out in the instructions, but I caught it before putting it in the oven. I love this cake. My many friends are suffering from diabetes. I invited them over for next week. So I think I’ll prepare this cake for them. Thanks for your recipe. Hi Sofia! I haven’t tried it, but you could try 3/4 cup of coconut flour. Let me know how it works out! I made this cake with little exceptions and turned out great! I did not use clove and used less amount of nutmeg. I used coconut milk instead of almond. The cream was only full fat cream cheese with less of the powdered sugar. It was for my child’s Fall -themed birthday party and everyone liked it. The first time I made it I put coconut flour instead of almond flour, the same amount, without realizing it. It was not good since the coconut flour is so much more absorbent. If I did not read the comments afterwards to check if anyone had shared he same experience, I would not even know that I made the mistake. For the cream I put the vanilla and cinnamon but did not liked the taste,so the second cream was double dose and only cream cheese with sugar. Is there any other flour then oar flour that you can use? You could try using regular, all-purpose flour! Just made this cake for Christmas and it turned out perfectly! Not one person could tell it was a gluten-free lightened up version. And as someone with type-1 diabetes, I appreciated that the glycemic load was more friendly than traditional carrot cake. I like the idea of using oat flour in a carrot cake as I have never done that before. Will definitely give it a try. Thanks for sharing the recipe. It’s fabulous. I hope you love this one! Hi! I’m definitely making this cake for Easter. Can I sun dried cranberries for the raisins? Thanks! any dried fruit will work! Just took them out of the oven and they are perfect! Im obsessed! So easy and delicious! I also changed the frosting a bit, I swapped the sugar for maple syrup and omg its so good! I also did not use a hand mixer and I use home made oat flour! Thank you so much for the recipe! So happy you loved this one Ema!! Thank you Monique for the recipe! I made this recipe as cupcakes for my husband’s retirement party (so I had something to enjoy along with his carrot cake.) It was absolutely delicious and will be a recipe I will enjoy over and over. The recipe made 21 cupcakes for me and I used oat milk instead of almond milk (as that is what I had at home) at it worked great. I added in all the add ins, so it took around 20 minutes or so to bake as they were pretty dense with the pineapple, etc. So delicious and none of that gluten free taste from a gluten free flour blend. I love baking naturally gluten free and without refined sugar. Great recipe!! Perfect! I hope everyone loved them 🙂 Those add-ins are incredible. Glad you found this one! Hi Monique, this recipe looks absolutely delicious!! I wonder if I could substitute the maple syrup for coconut sugar, any ideas if that would work? I think that would definitely work well! I was wondering if I could substitute whole wheat pastry flour for the gluten-free options. I saw a comment from back in 2016 where you said you hadn’t tried it, but I wanted to check in to see if that had changed at all! Hi Sara! I haven’t tried in this recipe, but this is a great alternative 🙂 Enjoy! I halved the carrot cake recipe with raisins and walnuts but somehow ended up with 12 cupcakes even though I filled the cupcake liners 3/4 full. 🙂 I didn’t halve the icing recipe and it was enough to generously top all cupcakes (what can I say – I like my icing). This recipe is fantastic! The cake is light, moist and just sweet enough. The icing really takes it over the top. AND IT’S HEALTHY!! Thanks SO much for sharing!!! Perfect! Glad you loved this one 🙂 one of my favs for spring! I just made this recipe today and all I have to say is oh my GOSHHHH. I made cupcakes instead of a cake and they are SO good. I was worried because I had to make my own oat flour and almond meal. I currently live in Spain, and some of the healthier options are limited here. I am so happy I took the chance, because this recipe will now forever be on repeat. THANK YOU!